Rainforests have become known as treasure troves of plants and animals. In fact, the Earth's rainforests collectively host 50 percent of known plant and animal species, although these habitats cover less than 2 percent of the planet's total surface area. Rainforests exist on every continent except perennially cold Antarctica, with frogs clearly the most prevalent amphibian in each ecosystem. In fact, the Amazon Basin alone contains over 1,000 species of frogs. Brilliantly colored poisonous frogs populate South and Central American rainforests. Like other potentially lethal animals, the frogs' striking colorations broadcast a warning to their would-be predators. The frogs' skin secretions are so toxic that some local cultures' hunters have coated their blow dart tips and arrows with the poisonous substances. 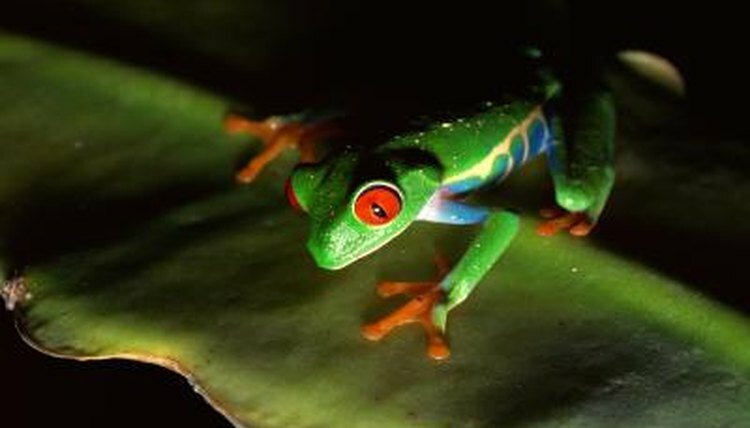 Poisonous frogs include the 170 dart frog species. While some dart frogs' secretions merely taste atrocious, other toxins can paralyze and kill a predator quickly if ingested through the mouth. The golden poison frog (Phyllobates aurantiaca) is the most feared of all the dart frogs, containing sufficient poison to kill several grown men. A rainforest's moisture-rich environment provides an ideal habitat for amphibians who must continually replace moisture lost through their skin. Some rainforest frogs dwell high in the trees to catch moisture from rain. For example, the red-eyed tree frog (Agalychnis callidryas) frequently perches in the rainforest canopy, only coming down to ponds during breeding time. Tiny tropical tree frogs, less than an inch in length, also populate rainforest canopies, hopping down to breed in ponds and swamps during rainy season months. Specific rainforest frogs' venomous secretions have medicinal benefits. The giant Mexican leaf frog (Pachymedusa dacnicolor) produces peptides that can lower blood pressure by 50 percent when given in low doses in controlled tests. This prolific frog also is the source of another peptide that prevents blood from clotting, which might lead to new medicines for deep vein thrombosis, a sometimes-fatal blood clotting condition that can affect passengers on long airline flights as well as others who may sit for long stretches of time, putting them at risk for the condition. An Australian tree frog makes peptides that successfully combat medical conditions that resist conventional antibiotic medicines. Many rainforest frogs face potential extinction from a fast-moving fungal disease. Smithsonian Institution researchers estimate that 120 species of frogs have disappeared from Panama's central rainforest during the last 20 years. By capturing healthy frogs, and raising and breeding them in a fungus-free environment, scientists hope to keep some species from extinction. Rescued la loma tree frogs reside in a controlled Panama City park setting, while Panamanian golden frogs live at Washington, DC's National Zoo. These National Zoo frogs probably represent the species' last population, as Panamanian golden frogs are likely extinct in the wild. What Are Defenses of Sheep Frogs?